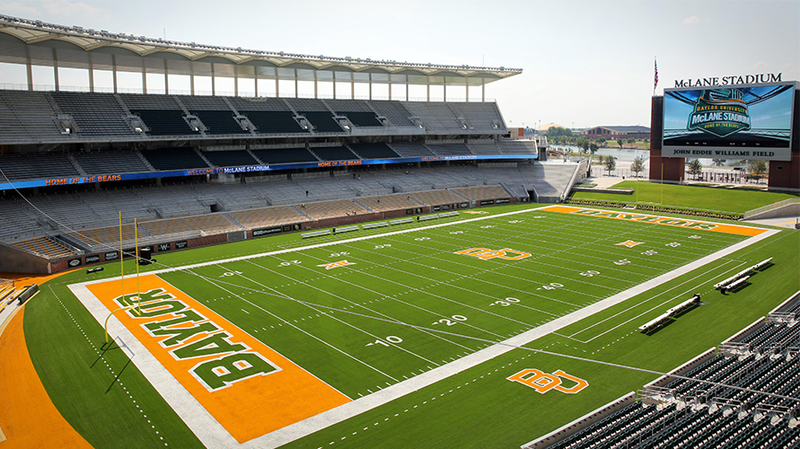 WACO, TX (August 27, 2014) — – The Aledo and Cedar Park High School football teams will be the first to play on Baylor University's new Matrix® Turf this Friday. The $260 million McLane Stadium was completed this summer and Baylor University chose Hellas Construction, yet again, to install their Matrix® Turf system. Baylor’s previous experience with Hellas’ Matrix® product at Floyd Casey Stadium led to their selection at McLane Stadium. Aledo High School has been playing on Hellas’ synthetic turf since 2006. Cedar Park High School’s home stadium is Gupton Stadium, which also features Hellas’ Matrix® Turf. Both teams are the last two Class 4A Division II champions and will have the honor of playing the inaugural game on Baylor’s new Matrix® Turf on August 29 in the new 45,000-seat McLane Stadium. “We are excited for Aledo High School and Cedar Park High School to continue their games on our Matrix® Turf and be the first to play at Baylor University,” said Reed J. Seaton, President & CEO. McLane Stadium also opens its doors this Thursday for Traditions Rally, a free community-wide celebration that will give everyone an advance opportunity to celebrate the upcoming season and get a look at the new stadium. The event will include a Baylor football pep rally with the Golden Wave Marching Band, spirit squads and members of the Bears’ 2014 football team and fireworks show over the river to close out the celebration. The Baylor Bears will open their 2014 season on the new synthetic turf against the Southern Methodist University Mustangs on Sunday, August 31 at 6:30 p.m. CT which will be nationally televised on FOX Sports 1. Baylor University is a private Baptist university in Waco, Texas. Baylor University is the oldest continuously operating university in Texas. It participates in seventeen intercollegiate sports, and is a member of the Big 12 Conference for all NCAA Division I athletics. The recently-named McLane Stadium will open in 2014 as the home of the Baylor Bears, replacing the Floyd Casey Stadium as their current home. Visit www.baylor.edu for more information. Aledo High School is a 4A high school located in Aledo, Texas. It is part of the Aledo Independent School District located in south central Parker County. Betsy Blaney of the Associated Press wrote that Aledo is a "powerhouse" in American football. For more information, visit www.aledo.schoolfusion.us/. Cedar Park High School (CPHS) is a high school in Cedar Park, Texas; it was established in 1998 to serve as the second high school in the Leander Independent School District. For the 2009 football season, the Cedar Park Timberwolves football team competed in the 16-5A district. They were District Champions in the 2009 and 2010 season. After the final playoff game on December 21, 2012, Cedar Park became the 2012 State Champions. For more information, visit http://cphs.leanderisd.org/.